A Current Strategy of the House of Rothschild and Japan | Think the Unthinkable Future. I once wrote down the reason why I launched this new English weblog as a voice of Japan. So far, I’ve not seen any experts in Japan, who deliver their analysis and comments on global macro in English in the internet. Of course, you can find plenty of analysts and strategists even in and near the Japanese market. However, the point is the way of their thinking and analyzing is usually very, very narrow-scoped and doesn’t cover the whole world of global macro. With this weblog, I just want to try to show you analysis of global macro can be also done from the Japanese viewpoint, while the Japanese market and its indices like the Nikkei 225 are incorporated in the global macro. Based on analysis I can derive from such genuine Japanese stuffs from the market, you can anticipate what will occur in the near future in the global macro and world community. Therefore, my main battlefield are always the Japanese (stock) markets and its indices, even though the products of my analysis are directly connected to the whole world through the global macro. Japanese experts on macro economy concentrate instead rather on local/national affairs and make their analysis public only in Japanese (“Analysis of the Japanese, by the Japanese and for the Japanese”). In addition, the way they’ve been discussing is quite controversial, because they tend to single out only Japan and treat the rest of the world as if they would have forgot it. In this context, the global macro or current interconnectedness of transnational in- and outflow of capital is never highlighted. Fora of opinions in Japan, in which they get together, are totally isolated from those of other (western) countries. With this tiny weblog, I just want to get rid of such a fatal situation in Japan and set new standards of analysis of global macro to both of Japan and the whole world. Just take a look at the above shown photo of an English article. On the way from Los Angeles to Honolulu by UA, I found it by chance in the Financial Times dated October 10. It refers to the forthcoming “loan crisis” among SMEs in the peripheral countries in Europe. When it comes to “Europe”, you can simply imagine its biggest issue must be the Euro crisis. Southern European countries such as Greece, Spain and Portugal still suffer from their heavy debt issues, which you should have known for long time since 2010. The situation around SMEs is quite different. 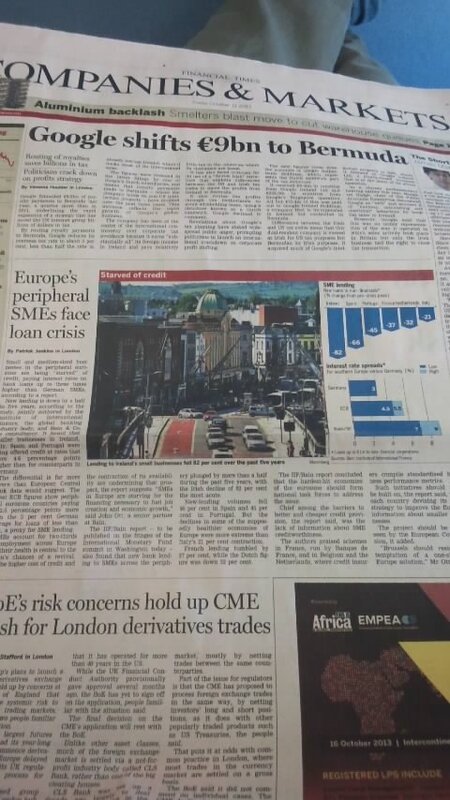 “Loan crisis among SMEs in the peripheral countries?”, you’re now wondering, I suppose. To be honest, every connoisseur of the real global macro vividly knows not the various debt crisis in Southern European countries but this SMEs-related problem is the very key issue we should urgently tackle. The current strategy of the House of Rothschild, of which I was informed by the person directly involved in this matter in Tokyo, obviously shows that is true. The facts, 1) the House launched a rescue fund with the amount of 40 billion yen by itself behind the door (Nobody officially declares the existence of such a fund either in Europe/USA and in Japan.) and 2) the House financed the half of it (By the way, the rest was financed by 12 big Japanese families! ), clearly tells us how decisively important the loan crisis among SMEs in Europe is. My source pointed out it’s a rare case that the House decided to settle up such a fund by itself. The situation is far more worse than you might expect. The point is I’ve got this highly confidential information in the last spring. I’m sorry but to be honest, almost all of you didn’t know that so far, I guess. Now that the FT highlighted this issue in October, you finally know its (maybe historical) importance. This is one of the best examples for what I actually wanted to say: “Tokyo is a top city of financial intelligence, where you can enjoy such a top secret in the market.” In this mean, Tokyo is really a great city besides the City of London and New York, I must say. The only problem is the majority of the Japanese isn’t aware of that yet and hasn’t fully made use of this profile of Tokyo. Keep in mind the significance of Tokyo in the context of global macro. And keep eyes on what’s going on among SMEs in Europe! At least statistics in accordance with the HKD’s algorism shows a dramatic up and down would soon come in the Japanese stock market and the whole world. As I explained in the previous post, “October 17, 2013” must be one of “the moments of the truth”. At that time, everybody in the world would recognize the Japanese stock market would have been drastically went up at first. Then, the question is “How long will it be maintained?” Implying the duration would be prolonged till the second week of November, 2013, my alliance partner HKD warns something dramatic and decisive indeed could reveal on October 28, even though the current rebound would continue till the first half of November. A very huge volatility. Be extremely careful. – In spite of a successful conclusion of the 7 party-talks, the situation in the ME would be worsened, and the two great enemies vis-a-vis Iran, the Israelis and Saudis, would finally make up their mind to attack the Iranians by military means. – This would cause a sudden backfire of the US debt crisis, because of widely spread fear that possible intervention of the US military in the ME would lead to drastic accumulation of the federal debt again to enhance its military mobility. Besides these two issues, don’t forget also the Argentina’s debt crisis. Or even a complext of all the risks would explode simultaneously, I must say. Before that, the Nikkei 225 could rise approximately to 16500. After the climax, everything in the market would be shuffled with a huge volatility, which, of course, could negatively affect all the political, economic, geopolitical and social affairs in the world.